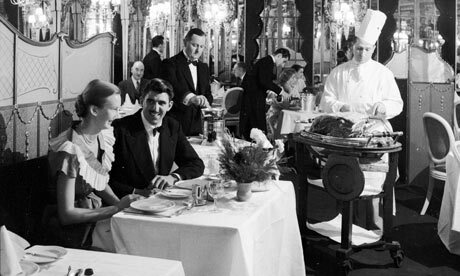 The Cafe Royal was a restaurant and meeting place originally conceived and set up by Daniel Nicholas Thévenon, who was a French wine merchant. He had to flee France due to bankruptcy, arriving in Britain in 1863 with his wife, Célestine, and just five pounds in cash. He changed his name to Daniel Nicols and opened a cafe restaurant in 1865 at 15-17 Glasshouse Street and it became the Cafe Royal in 1867. By the 1890s the Cafe Royal had become the place to see and be seen and was very popular with those who practised the arts, becoming “the nearest thing to a true Arts Club London has ever seen”. Its patrons included Oscar Wilde and many other literary figures, such as W.B. Yeats, Ernest Dowson, Aubrey Beardsley, Paul Verlaine, Frank Harris, Arthur Symons, Max Beerbohm, Virginia Woolf, and George Bernard Shaw. Well known artists would also meet here and these included James McNeill Whistler, Augustus John, Jacob Epstein, William Rothenstein, Walter Sickert and his colleagues in the Camden Town Group. 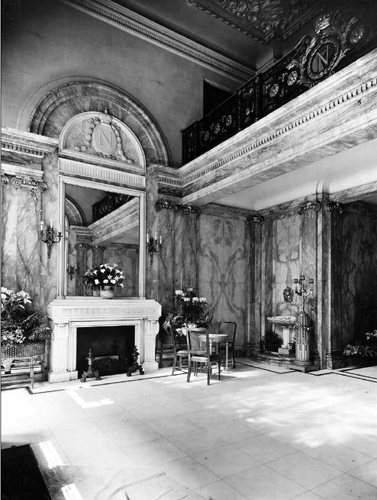 The Cafe Royal was also frequented by a number of well known people ranging from Lord Alfred Douglas, the young Edward VIII and George VI to the occultist Aleister Crowley. In more recent years Winston Churchill, Noël Coward, Brigitte Bardot, Mick Jagger, Elizabeth Taylor, Muhammad Ali and Diana, Princess of Wales all visited. 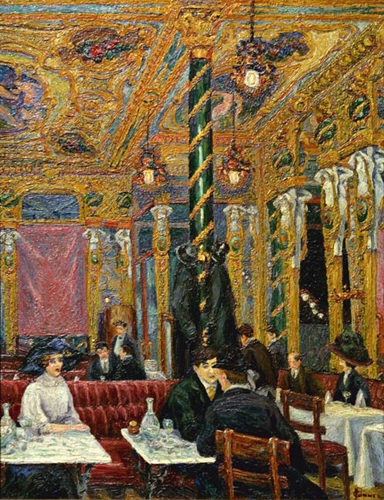 The interior of the old Cafe Royal was captured in several paintings by such as Nina Hamnett, Charles Ginner, Harold Gilman and William Orpen. The premises were rebuilt in 1923-24 so that all buildings on the Quadrant of Regent Street conformed to the prototype, the Piccadilly Hotel. The present Grill Room stands where part of the Domino Room used to be. The Brasserie, which replaced the artists’ rendezvous, was constructed in the space now occupied by the Restaurant on the ground floor. From 1951, it was the home of the National Sporting Club, which staged boxing matches and other events, usually attended by a host of sporting stars and celebrities. 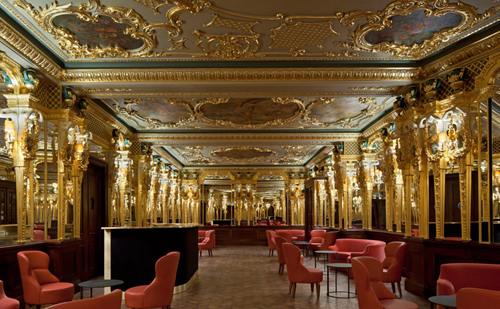 The Cafe Royal entered a new era after 1972, when it was bought by David Locke. The establishment saw a boom at this point, with great emphasis on its vast array of wines being offered for its patrons. The Cafe Royal closed in December 2008. The Crown Estate, which owns the building, embarked on a £500m redevelopment to open up the southern end of Regent Street and create 44,000 sq ft of new open space. The premises have been redeveloped into a luxury hotel by an Israeli property company, Alrov. The building is a listed Grade II. 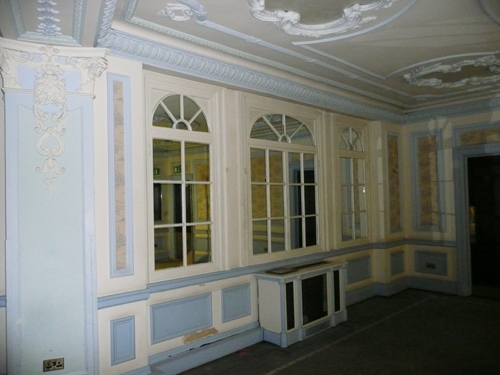 I was commissioned to carry out the paint analysis of a number of the rooms including the famous Grill Room; the Celestine Room; Club Room; Pompadour Room; Domino Room and Empire Room. 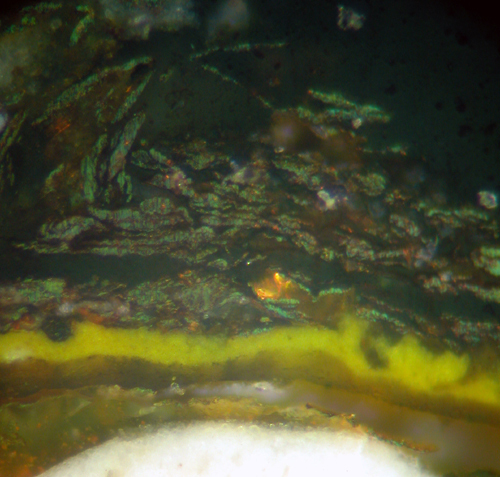 There was a distinct hierarchy of treatment, with gilding and coloured glazes being applied to some and bronze paint and flat colour elsewhere. The Club Room appears to have been decorated on about eleven occasions. The decoration suggests that it was originally a high status room, with the surfaces being glazed and the mouldings gilded. 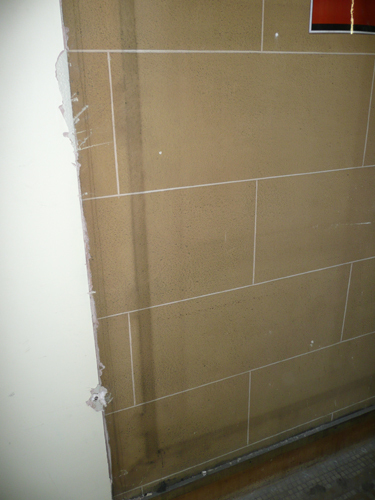 The walls were a buff colour created by a thin layer of tinted glaze on top of a pale stone-coloured paint. The mouldings on the walls, pilasters and architraves were gilded. 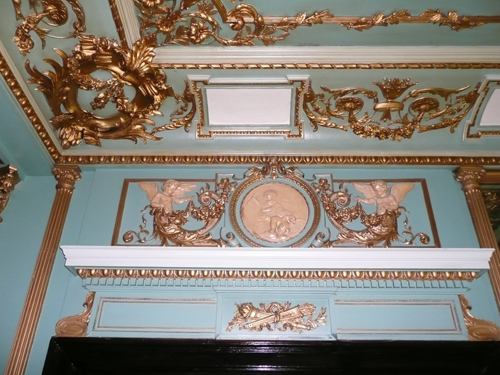 The beds of the pilasters were given a red glaze and those of the trophies in the centre of the north wall and the overdoors had a blue glaze (as can be seen below). 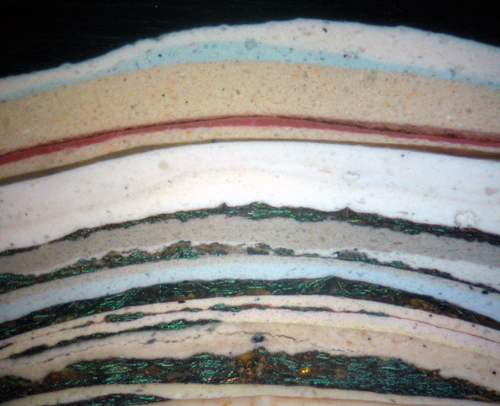 The surfaces display a very uneven number of decorative schemes and it is clear that changes have taken place. There is evidence, however, of the room having been decorated on eleven occasions. 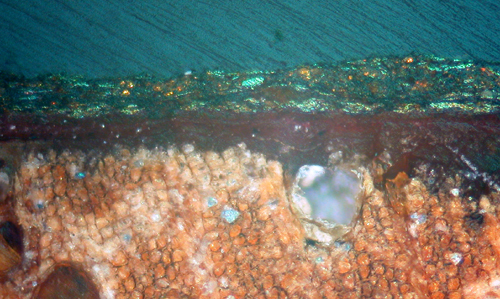 The walls appear to have been painted in a buff colour originally. 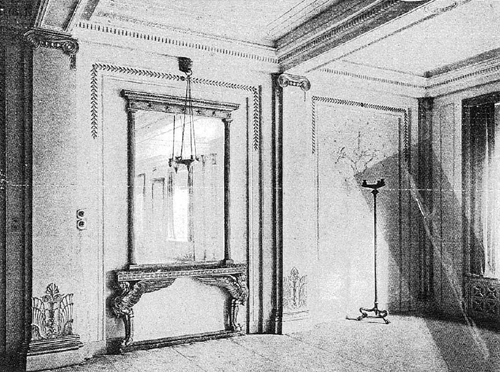 Gilding had been applied to the laurel leaf mouldings; mirror frames; monopod tables (as shown above) and also to the leaves on the window architraves. The cornice and ceiling were also painted a buff colour as were the small stars on the edge of the ceiling bed. Whilst the original decorative scheme is reasonably clear, there are aspects of the decoration of this room that are a puzzle. Some surfaces quite clearly display as many as twelve decorative schemes others seem to have been painted on only six occasions. The initial scheme was a brown zinc-based paint and the decorative mouldings were coated with bronze (metallic) paint. 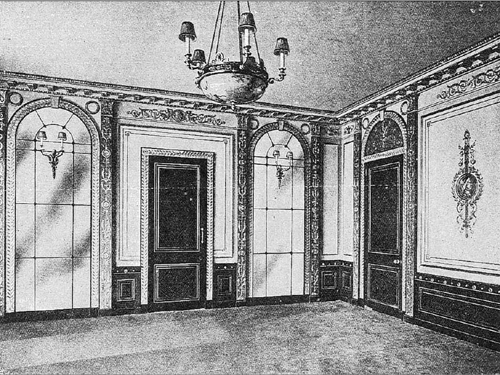 The surfaces in the Pompadour Room have been decorated an uneven number of times displaying between three and seven decorative schemes. The original effect would have been quite dark with a dull varnished red finish on the lower walls and brown on the upper walls. A buff colour was used on the ceiling. The use of gold leaf would have added some life to it however. 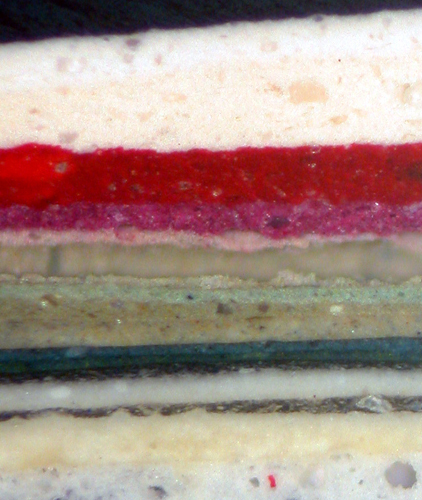 Pompadour Room: Cross Section from Panel Moulding. The Cafe Royal has recently been reopened after a major refurbishment. 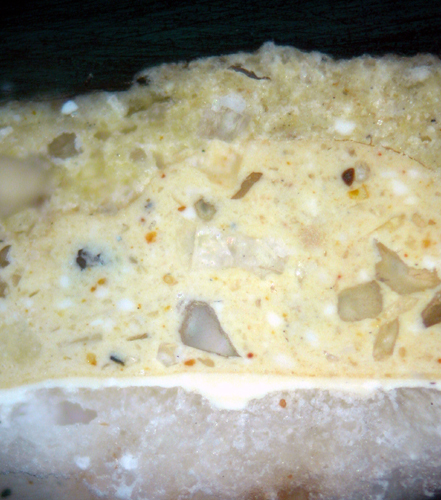 The interiors can be seen here. Papers and Paints mixed most of the paint colours.